There have been so many flavors of Shur-Shot over the years, but this is the one they got just right. This one was officially called the Agfa Ansco B2 Shur-Shot, with no other modifiers, and we have adopted that for our purposes here at MFBOXCO. Made at the height of the Agfa Ansco partnership, it is still very easy to find today, has a fantastic set of features, and shares "The Agfa Ansco Advantage" in full force! Only the "Specials" have more options that the humble B2 Shur-Shot. We especially like the minimal design, the quiet shutter, and the liberal use of metal parts that create this surprisingly solid-feeling box. The smaller tab activates a Bulb mode. It is labeled Time, but it actually works like a Bulb mode - you hold the shutter open and it closes when you release the trigger. This camera also features a second, larger slide-out tab with a yellow filter and a second aperture that slide across the lens. 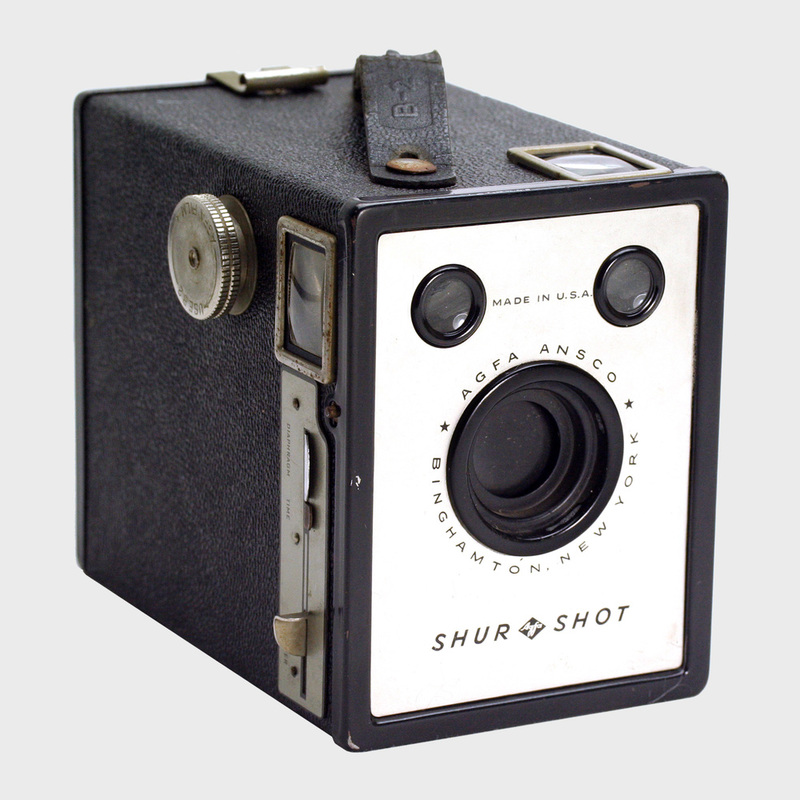 This is often seen in the Agfa Ansco "special" cameras, but is part of this basic Shur-Shot. Rounding out the solid feature set is an "Always Off" shutter, a metal knob winder that is easier on the hands, and bright viewfinders. These cameras have a removable all-metal film holder. Pull out the winding knob, then open the latch to open the back. Winding film onto this type of holder can be tricky, and we recommend you pick up one of our Winder Keys to ease the process. Also make sure that the tension bars are applying proper friction to keep the film tight. If not, bend them outward slightly with your thumbs. We have noticed that the faceplates vary slightly. We have seen what appears to be white painted or enameled, a "raw" metal version and one with a slight gold tint. However, these might all be the same faceplate that have simply worn off differently - we're not sure. If you know more, please contribute! Plentiful, solid features and nice minimal styling.